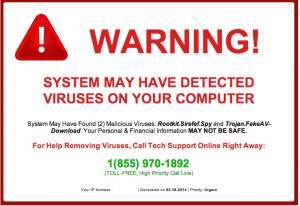 We have seen a number of desktops and laptops from customers with a virus that tries to trick them into calling a phone number for help. NEVER call this number that flashes on your screen. It could be a popup in your web browser, as well as changing your desktop wallpaper and also having the “tech support” phone number displaying in the taskbar. IF you were to call this number, you would most likely be greeted with a foreign person claiming to be from Microsoft or a major tech support company and they would direct you to go to a website that would give them control of your computer. If you are browsing the web and suddenly see your computer screen flash telling you that you have a virus and to call for help, DO NOT call the number displayed. Shut your computer down and call your trusted I.T. company to have your computer thoroughly cleaned to make sure nothing was compromised and get you back to work.